Hello guys, we are up again with another amazing offer from Airtel and it called "Airtel Triple data" Well this offer has been going on for quite sometime now, and some Airtel subscribers have been enjoying the offer. When it comes to network coverage Airtel is really doing good unlike Glo that have poor network coverage that's so annoying when it comes to browsing the net with data or with cheat. So we think this offer will do you more good just scroll down to get full details. But we all know Airtel with their Sim selectiveness. But never to worry there's no harm in trying who know you might be very lucky. 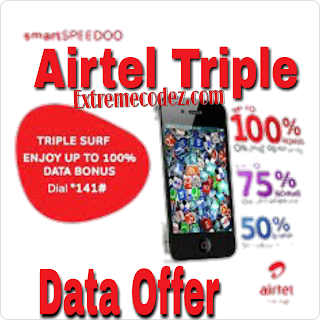 =>> Buy a new Airtel sim card Or use an Airtel sim less than 3 months old. =>> Or recharge 2000 naira normally and dial *141*2000# (valid for 30 days) = 3.5GB x3= 10.5GB + other smaller bonuses. Don't forget to drop your comment if this offer works for you or not also share this news to your friends. Load either 500 naira normally and dial *141*500# (valid for 14 days) 750mb x3 = 2.2GB.